The revival of Stephen Sondheim's musical Sunday in the Park with George has swept the board at the prestigious Laurence Olivier theatre awards. 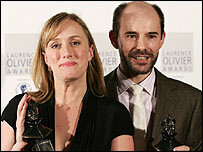 The show won five trophies, including best musical actor and actress for its stars Daniel Evans and Jenna Russell. 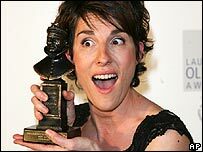 Rufus Sewell won best drama actor for Rock 'n' Roll and Tamsin Greig won best actress for Much Ado About Nothing. But Monty Python musical Spamalot failed to win any of the seven awards it was nominated for. Based on the 1975 Holy Grail film, the comedy led the nominations going into the ceremony at London's Grosvenor House Hotel. Seurat (1859 -1891) is famous for his use of coloured dots, a theme reflected in the musical. The show was first performed in New York in 1983, starring Mandy Patinkin and Bernadette Peters. Hannah Waddingham, who lost out in the best actress category, said she was unhappy at the result: "I don't begrudge the best actor or best actress award at all but I really do begrudge the fact we didn't win best new musical. "Surely if you are nominated in seven categories there is a reason for that and at some point that should be acknowledged." Accepting her award, Greig jokingly thanked her three children "who let me live away from home seven months and didn't seem to care" while she worked on the RSC production. Rock 'n' Roll director Sir Trevor Nunn read out a speech in which Sewell declared the win "an amazing honour". Sunday in the Park with George, at the Wyndham's Theatre, also won for production, lighting and set design. In other awards, the prize for best supporting role in a play went to Jim Norton in The Seafarer, a Christmas tale of drinking buddies in Dublin. 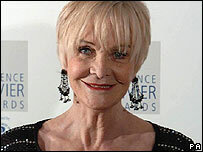 Sheila Hancock was named supporting role in a musical for Cabaret, while Javier De Frutos won an award for choreography for the same show. The best director of a play was Dominic Cooke for Arthur Miller's work The Crucible, which was also named best revival. Patrick Barlow's adaptation of John Buchan's The 39 Steps won the Laurence Olivier Award for new comedy, while best new play was Blackbird by David Harrower, in which a woman confronts the man who abused her as a schoolgirl. A version of the Broadway hit Caroline or Change collected best new musical, while the Royal Ballet's Chroma was best new dance production. The English National Opera received two awards for Jenufa - best new opera production plus an outstanding achievement award for soprano Amanda Roocroft. 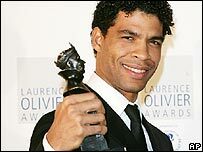 There was also an achievement prize for Carlos Acosta, recognising his work at Sadler's Wells in London, while Pied Piper at the Theatre Royal in Stratford, east London earned a similar accolade for an outstanding performance "in an affiliate theatre". And a special award went to opera singer Sir John Tomlinson, who was described as "internationally renowned for his definitive interpretations of a wide variety of roles".